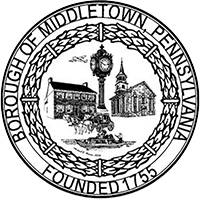 Middletown Borough hereby gives notice of the 30-day public comment period for its National Pollutant Discharge Elimination (NPDES) Stormwater Discharges from Small Municipal Separate Storm Sewer Systems (MS4) Pollutant Reduction Plan (PRP). Best management practices (BMPs) are proposed in the Plan to satisfy PRP requirements for the Chesapeake Bay and local stream impairments. The public is invited to review this document and provide written comments to the Borough Manager, Ken Klinepeter at 60 West Emaus Street, Middletown, PA 17057 (kklinepeter@middletownborough.com). The 30-day public comment period begins August 1, 2017 and ends August 31, 2017. The Plan will be discussed during the regularly scheduled municipal meeting on August 15, 2017 starting at 7PM, at the municipal building.